This new, comprehensive text covers skin diseases of the horse from essential basics to practical diagnostic methods, therapy, and specific abnormalities and defects. 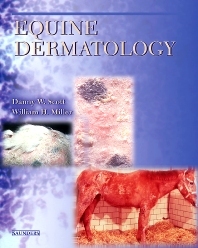 Well illustrated and expertly written by two of the leaders in equine dermatology, this focused presentation discusses all aspects of bacterial, allergic, and environmental skin disease. Relevant topics in a clinically useful format make this an ideal resource for all veterinarians, in addition to anyone specializing in equine medicine. Hundreds of clear, high-quality photographs and illustrations, including 72 color illustrations, demonstrate dermatoses. Material is extremely well organized for easy access to specific topics. Tables in each chapter provide quick reference to important facts and details. Each chapter follows the same logical format, making information on any topic easy to locate: history, diagnosis, treatment, and client education. Drs. Scott and Miller are prominent equine dermatology experts writing from their own clinical experience and research. An extensive list of references at the end of each chapter directs the reader to further sources of information. All equine skin diseases are discussed in one source, for an essential compilation of clinically relevant material. All dermatoses are thoroughly discussed, covering etiology, pathogenesis, clinical findings, diagnosis, and treatment.